One of the joys of travelling abroad is trying out new things. But a hot climate, different food and more fizzy drinks or alcohol than you would normally have can sometimes lead to an upset stomach and feeling unwell. This is not necessarily the result of poor hygiene or contaminated food and water but it can still be unpleasant. 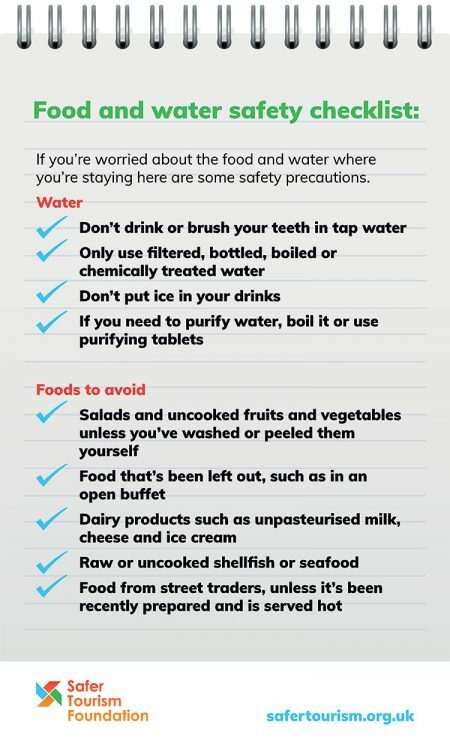 If you are in a hot country you can help reduce the risk of becoming unwell by ensuring you don’t stay in the sun for long periods and always wearing a hat and sunscreen. Wherever you are it’s important to keep hydrated so drink plenty of water and if you’re in a bar remember that alcohol measures can be larger than in the UK. If you have a food allergy, ask for information about ingredients before eating. Always wash your hands before preparing or eating food, after handling money and after going to the toilet. In case there’s no water available it’s a good idea to keep some hand wash wipes on you. Only use filtered, bottled, boiled or chemically treated water. Bottled drinks with an intact seal are usually safe, as are boiled water and hot drinks made with boiled water. The most reliable way to purify water is to boil it but if this isn’t possible use water purifying tables that you can buy from pharmacies or specialist travel shops. Food from street traders, unless it has been recently prepared and is served hot on clean crockery. Food served in smart hotels or restaurants may not always be safe as it may have been contaminated during preparation. Where possible choose places to eat that have a reputation for serving safe food and only eat freshly prepared food that is thoroughly cooked and served steaming hot. If you’re unfortunate enough to fall ill tell your travel company or your accommodation provider straight away. They should be able to help you get medical help if necessary and if they have provided your meals they will be able to investigate the source of the problem. If you suffer from diarrhoea there are a number of things you can do. See the NHS Choices website for details. If you fall seriously ill and need to go straight to hospital contact the emergency services. The standard emergency services number in the European Union is 112. 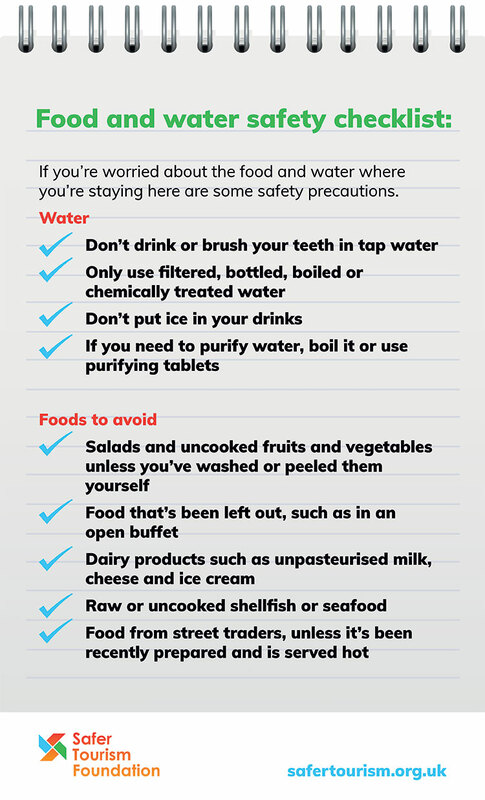 Food poisoning due to poor hygiene in hotels and restaurants abroad is thankfully rare. But if you do want to make a complaint the people you should complain to will depend on how you booked your holiday. If you are an independent traveller you will need to complain directly to the place where you ate. If you then want to make a claim you can do this yourself or wait until you get home and get legal help. You could use a claims management company to help you but they will of course charge for this. If you have gone on a package holiday, you should talk to your tour operator rep. If you want to make a claim then as soon as you get back to the UK you should contact your tour operator directly. If you are not satisfied with the response you get you can contact ABTA to use its Alternative Dispute Resolution scheme. If your tour operator is not a Member of ABTA you can pursue the claim through the Small Claims court. Since 2013 the number of holiday sickness claims made by Brits has increased by 500% even though there has been no increase in claims from holidaymakers from other countries who have stayed in the same hotels. This has resulted in British holidaymakers being accused of having the most delicate digestive systems in the world. ABTA has also accused some claims management firms of unscrupulously trying to persuade British holidaymakers to make bogus claims for food poisoning, a crime which can result in a prison sentence of up to three years if the claim proves to be fraudulent. The cost of all these bogus claims is of course eventually borne by honest holidaymakers. Not only are there fears that package holiday prices will have to rise but some hotels are thinking of stopping their all-inclusive deals while others are considering not accepting British guests. It also makes it much harder for those who have a genuine grievance. But if you have a genuine claim you should not let this put you off.